as a result of additional staffing, improved maintenance, and upgraded facilities. $182 million in additional park funding approved by state lawmakers." If you read the last three entries about the parks around this country that are in jeopardy of being closed because of the downturn in the economy and subsequent loss of tax revenue, you've got to be wondering how this is possible! Additional staffing? Improved maintenance?? Upgraded facilities??? Yougottabekidding! How many states can claim that their legislature has approved more funds in the last couple of years for state parks and historical sites, not cut their park budgets to bare bones???? In this entry I'd like to give some well-deserved kudos to the extensive, apparently well-managed Texas State Park system. If it has serious problems I'm sure not aware of them. That's the heading on one of the early pages in the hard copy of the 2009 Texas State Park Guide, which highlights details about improvements at several of its sites after that additional $182 million in park funding was approved by the state legislature in 2008 or 2009. You can view a copy of this colorful, 116-page booklet online or request a free paper version from the website. I think the guide is updated every two years. The 6- by 9-inch booklets are crammed full of enticing photos and descriptions of 100+ state parks and historical sites in Texas (I counted 104 of them). For someone like me the guide is a travel "wish book." Our copy is getting dog-eared already. I'm almost as eager to explore these sites as I am the national park system. I am probably going to sound like a paid promoter for the Texas Parks & Wildlife Department or the Chamber of Commerce in this and the next few entries about specific parks we visited this winter. I'm not on their payroll, unfortunately. I just know a good thing when I see it and I want to encourage other folks to visit these parks so they'll remain open. That's my only financial interest in them. the campground and buildings. The park has re-opened with limited camping and day use. I also want to commend everyone responsible in Texas (lawmakers, parks personnel, volunteers, donors, etc.) for allowing visitors from all over the world -- not just Texas -- to enjoy such a wide variety of geographical, cultural, and historical sites at an affordable price. Many of these parks make great vacation destinations for families, couples, or individuals who enjoy the great outdoors. Texas is in marked contrast to lots of other states that are closing parks and reducing services in the remaining ones. Not only is Texas maintaining all of its state parks and historical sites, it has also opened a couple of new ones in recent years, it is keeping prices reasonable (although they have been going up), and it is continually making improvements to them, such as upgrading the campground utilities at Huntsville SP, rebuilding Galveston Island and Sea Rim State Parks after they were destroyed by Hurricane Ike, and purchasing an additional 177 acres of land at Garner SP that includes a scenic bluff over the Frio River. 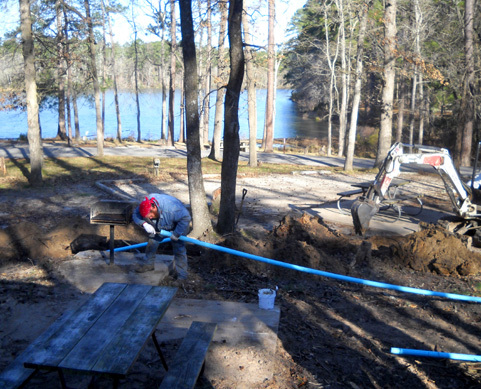 Workmen install an improved waterline behind our campsite at Huntsville SP in February. It was interesting to watch the progress in both campgrounds while we were there. 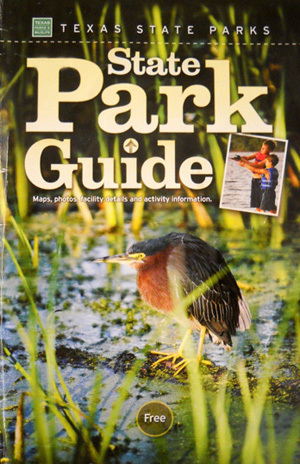 The guide describes specific improvements to other sites such as Big Bend Ranch (Texas' largest state park), Caprock Canyons (which has 64 miles of trails), Resaca de la Palma (part of the World Birding Center network), Bastrop (a popular park in the Hill Country near Austin), and the Battleship TEXAS (the only surviving battleship that fought in both World Wars). In addition to physical upgrades to facilities and trails at many parks, additional funds have allowed many of the parks to add staff, increase operating hours, reopen some campsites and trails, and enhance interpretive programs. I love the increased emphasis on enhancing visitors' park experiences with ranger-led talks and tours, exhibits, and signs. If folks go to a state park and have no written or visual aids or staff to explain what's special about the place, they could miss a lot. Various types of "interpretation" help them learn more about the natural, historical, and cultural resources in a park and just have a lot more fun. We've seen a lot of "interpretation" at Brazos Bend SP this month while we've been campground hosts, including the numerous signs we helped paint and erect, the very nice Nature Center and George Observatory, and all the interesting nature talks. Other parks have similar programs, although only one other state park has an observatory with star parties. In order to satisfy our own curiosity and be able to answer visitors' questions, Jim and I participated in several nature programs led by rangers and knowledgeable volunteers. We thoroughly enjoyed the talks about alligators, armadillos, bobcats, snakes, pond life, astronomy, and other topics. We weren't around long enough to be trained to work at the busy Nature Center but that's something I'd love to do if we decide to do work camping here or at another park in the future. 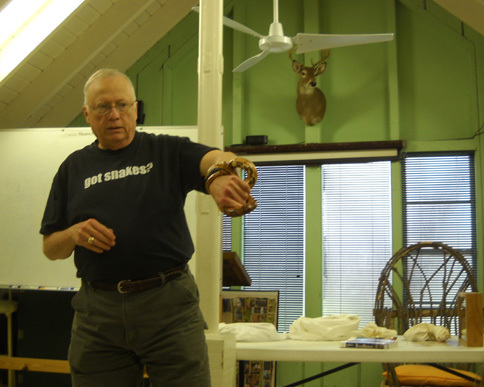 At Brazos Bend rangers and volunteers give many interesting nature talks, let visitors pet the baby alligators, non-venomous snakes, and fuzzy tarantula, and answer lots of questions at the well-equipped Nature Center. As a former teacher/trainer and perennial nature-lover, this is right up my alley. I could handle the alligator petting shtick, but I'm not so crazy about holding snakes and big hairy spiders! It would take years for anyone, even a resolute Texas resident or full-time RVer, to do justice to all 100+ state parks and historical sites in this humongous state. Not only does it take a day or more to drive from one side of Texas to the other, some of these parks are also relatively humongous and take several days (or weeks) to thoroughly explore. 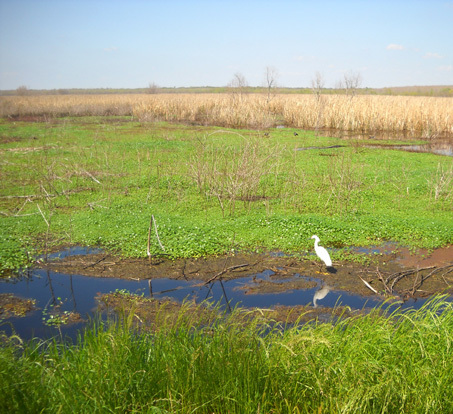 Brazos Bend is pretty big at 5,000 acres, for example, but it pales in comparison to Big Bend Ranch at 300,000+ acres! Each of the seven tourist regions into which Texas is divided -- Panhandle Plains, Hill Country, Big Bend Country, Prairies and Lakes, Gulf Coast, South Texas Plains, and Pineywoods -- has about a dozen state parks and historical sites that showcase the geology, history, and culture of the area. I'd bet you'll find some sort of inviting "water feature" at every Texas state park -- creeks, rivers, waterfalls, natural springs, wetlands, swamps, lakes, reservoirs, the Gulf of Mexico, and some man-made swimming pools, too. Because of the varied terrain, natural habitats, and weather across this large state you'd expect a correspondingly large variety of flora and fauna. You'd be right! I can't even begin to enumerate all the plants and animals you can find in Texas and its state parks. It's an ecological smorgasbord. Over 500 species of birds alone have been spotted around the state. Some are just passing through, of course -- like Jim and me, only these are the original sun birds! There's something in the Texas State Parks system for everyone. In fact, I think I could find lots of interesting things to do and see at every one of them. Here are some examples. Check the web guide and specific park pages for details, location, and photos of each park. It takes a while with a slow internet connection to download the large pdf. file for the guidebook the first time so you might want to save it on your hard drive for subsequent viewing. Are you a history buff? Texas is steeped in history and many of its state parks and historical sites pay homage to the people and the events that shaped it. I already mentioned the Battleship TEXAS. Or learn about the legendary "black bean incident" at Monument Hill. There's also the LBJ State Park and Historic Site that honor our 36th president, the Steven F. Austin State Park that honors the "Father of Texas," Washington-on-the-Brazos to commemorate the Texas Declaration of Independence, and San Jacinto Battleground, where the Mexican army was defeated. That's just the beginning. Texas probably has more official historical markers than any ten other states combined; its state parks and historical sites echo that fierce independence and pride. Celebrate Texas' German heritage in the Hill Country at Monument Hill/Kreische Brewery State Historic Sites. Other parks feature forts, old stagecoach routes and trading posts, the El Camino Real Trail, and at least two Spanish missions. 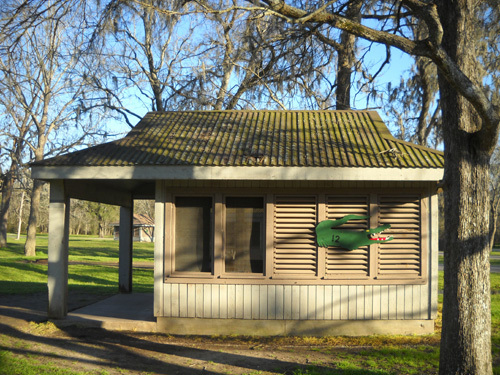 Admire the handiwork of the talented Civilian Conservation Corps (CCC) craftsmen and women who built thirty-one of the parks back in the '30s and '40s that are still operating today. They built many of the structures, roads, bridges, and trails in those parks. Popular examples are Bastrop, Balmorhea, Davis Mountains, Indian Lodge, Garner, Inks Lake, and Tyler State Parks. If the photos in the state parks guide are any indication, photographers have tons of material for interesting pictures at any one of the parks in Texas. I can't believe how many pictures I've taken while we've been here at Brazos Bend. It's definitely "picturesque." Here's something different: how about a park that has a 64-mile converted railway trail for hikers, runners, and cyclists, a tunnel you can walk through that is home to thousands of Mexican free-tailed bats, AND a herd of bison?! 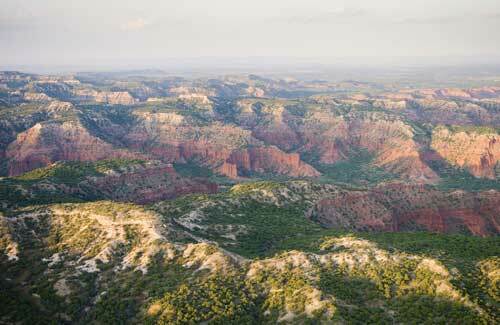 Head to Caprock Canyons SP (below) in the Texas Panhandle. You can also see bats at Devil's Sinkhole State Natural Area and Kickapoo Cavern SP. Explore some more caverns and caves at Colorado Bend, Devil's Sinkhole, or Longhorn Caverns, an old outlaw hangout and Prohibition-era speakeasy. 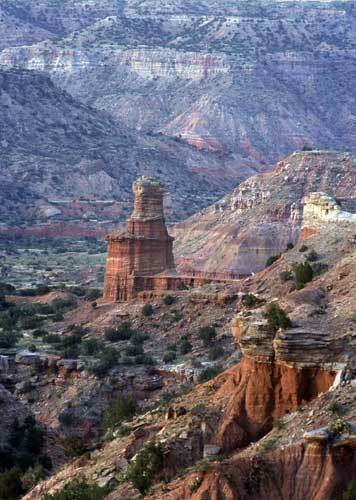 Check out Palo Duro Canyon, shown below, Texas' version of the Grand Canyon. This state park has campgrounds and rustic cabins on the canyon floor 800 feet below the rim, and lots of trails through the terra cotta badlands for foot, bike, and horse travel. Longhorns still graze in this park, and I think there is still a 50K/50-mile trail race here but I can't find a website or date for it this year. Climb boulders and mountains at Hueco Tanks and several other parks in the Big Bend and Panhandle regions. 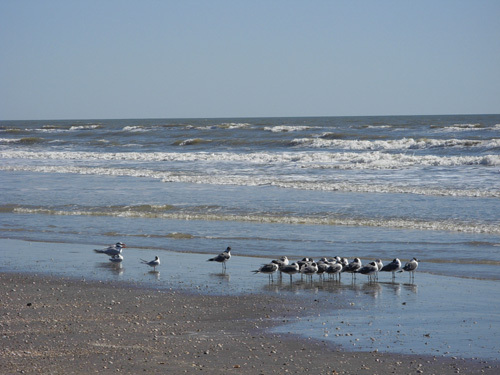 Surf the sand dunes at Monahans Sandhills or catch some real waves at any of the parks with beaches on the Gulf coast. Visit one of only two remaining lighthouses on the Texas coast that is open to the public at Port Isabel Lighthouse State Historic Site. Hike and bike the extensive trail system at Franklin Mountain, a mile-high mountain "island" within the city limits of El Paso. Wyler Aerial Tramway, a Swiss gondola, takes visitors to the top of nearby Ranger Peak, from which they can see three U.S. states and Mexico. 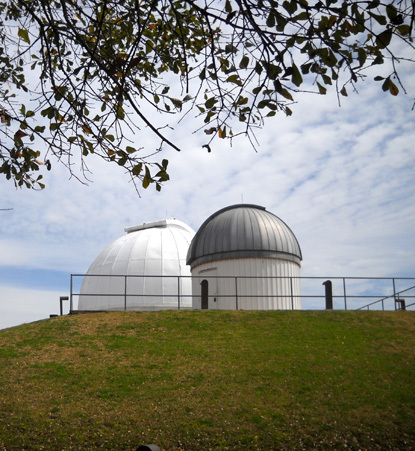 Attend a "star party" at the McDonald Observatory at Davis Mountains SP; there is another observatory at Brazos Bend. Got dinosaur lovers in your family? Check out Dinosaur Valley SP, where the limestone riverbed retains the Cretaceous Period tracks of nine gigantic dinosaurs -- and one of their predators! 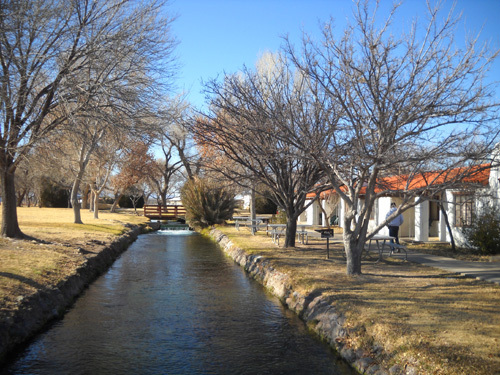 Swim or scuba-dive in the warm, crystal clear spring waters at Balmorhea SP, then enjoy its pueblo-style lodging and restored desert wetlands. Rather swim in a lake? Or fish or boat there? You've got many choices of state parks with scenic lakes and reservoirs in all seven regions of Texas. There is a facilities and activities index at the end of the printed and internet parks guide that lists all the parks with facilities for swimming, boating, paddling, fishing, and other water sports. Consider Choke Canyon, Lake Corpus Christi, Huntsville, Lake Livingston, Cooper Lake, Eisenhower, Fort Boggy, Lake Whitney, San Angelo, Village Creek, Martin Dies, Jr., or dozens of other parks. Tubing is popular at Guadalupe River, Lockhart, Garner, Pedernales Falls, and other state parks with river frontage. 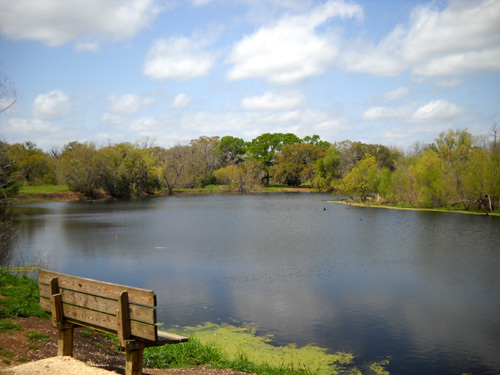 fishing boats are permitted on the lakes at many other Texas state parks. Anglers will also love the numerous parks with creeks and rivers that are full of fish just waiting to be caught. You can fish within Texas state park boundaries without a fishing license at more than fifty state parks. Martin Creek Lake and Fairfield Lake are popular places to fish in the winter because their waters are warmed by the electrical power plants they cool. You can also spot bald eagles there. 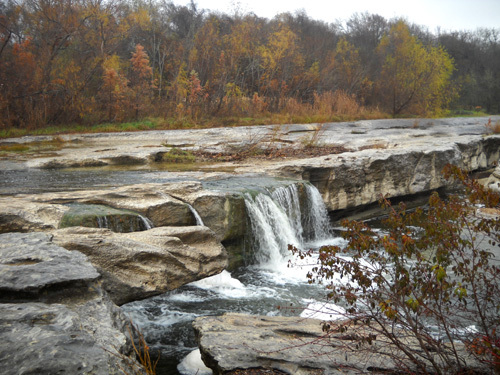 If you love waterfalls, several Texas state parks fit the bill: Colorado Bend, McKinney Falls, Pedernales Falls, Devils River SNA, and others. You're in luck if you're a birding enthusiast! 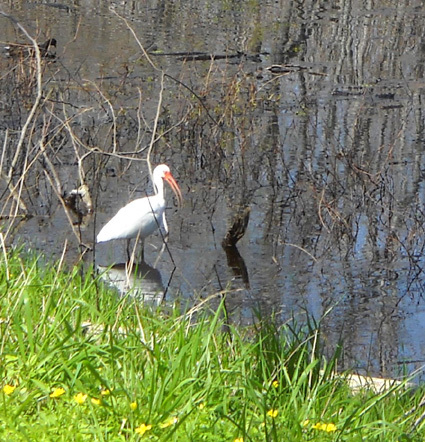 Many of the state parks are known for their large migratory and indigenous bird populations. For starters, head to Palmetto, Brazos Bend, Mustang Island, Goose Island, and Mustang Island. Even parks farther north, such as Big Spring, draw large numbers of birds and folks who love to watch them. 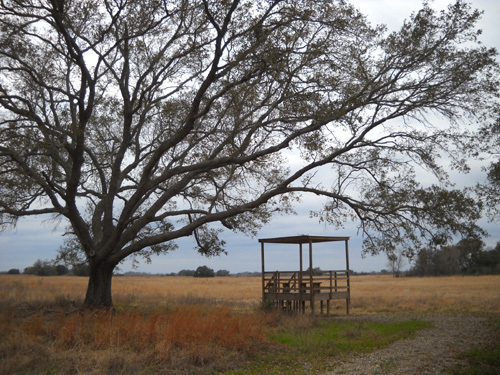 Bentsen-Rio Grande Valley SP is the headquarters for the World Birding Center. 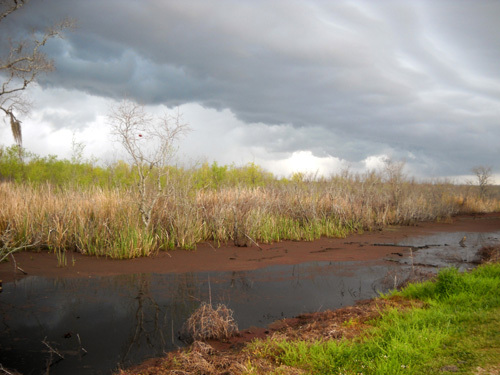 There are nine WBC preserves stretching about 120 miles along the Rio Grand River from Roma to South Padre Island; three of them are Texas State Parks. More than 500 bird species have been documented in the region. 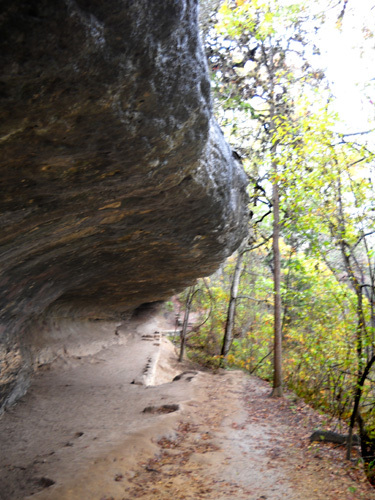 Hikers, runners, and cyclists can pick just about any of the state parks and find miles and miles of trails. The variety is endless, from wheelchair-accessible to rugged single track. Three of our favorites for dirt trails are Huntsville, Tyler, and Brazos Bend. We have many more to explore! Want to ride a horse? 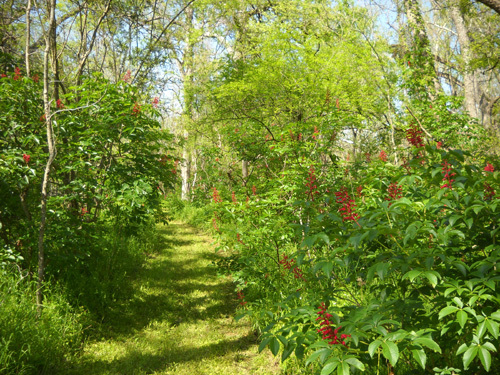 Two dozen parks provide equestrian trails. 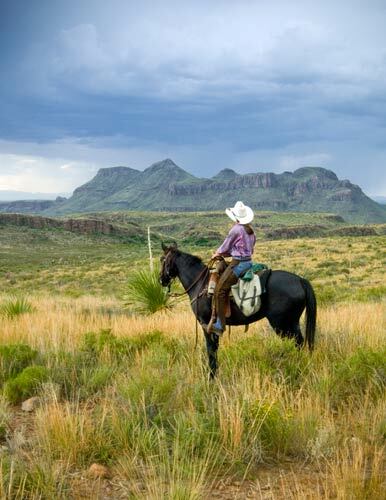 One of the best is the Hill Country State Natural Area (SNA) near Bandera, the "Cowboy Capital of the World." This is the site of the Bandera ultra runs. For more shade, head somewhere farther east like Huntsville SP with a lot of trees. Like swamps and wetlands? 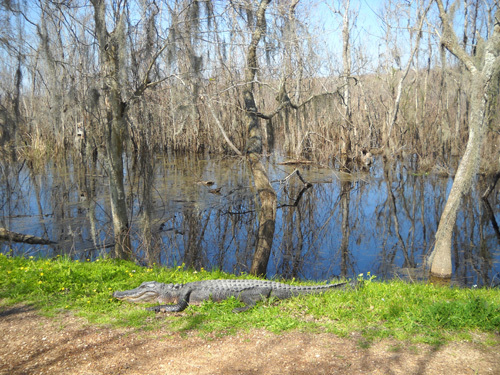 You can't beat Brazos Bend or Caddo Lake for their ancient bald cypress trees, variety of wildlife (including alligators), lakes, bayous, and sloughs. Indigenous dwarf Palmettos add a tropical ambiance to other parks like Hunstsville and the aptly-named Palmetto SP. Golfers will find 9- or 18-hole courses at several Texas state parks, including Inks Lake, Bastrop, Stephen F. Austin, and Lockhart. Or play disc golf at at Lake Arrowhead, which also features a prairie dog town. Those are fun! Check out the vivid foliage at Lost Maples SNA in the fall, but prepare yourself for the crowds of leaf-peepers when the maples are at peak colors. Eleven miles of trails wander though scenic and rugged limestone canyons and past dramatic overlooks above the Sabinal River. Spring wildflowers are a draw at the Lyndon B. Johnson SP and historic site; you'd expect that, with Lady Bird's wildflower legacy. 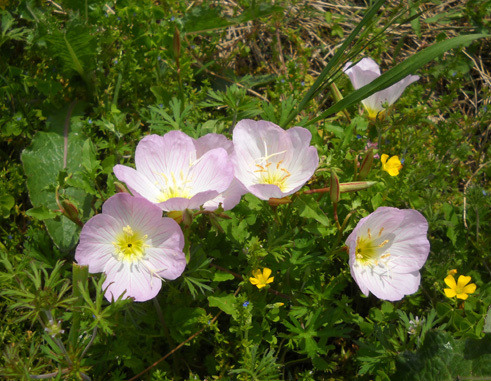 Native wildflowers thrive in all of the parks. I think it would be fun to visit some of the sites with unusual names like Possum Kingdom, Goose Island, Kickapoo Caverns, Devils River, Enchanted Rock, Lost Maples, and Mother Neff -- just because. 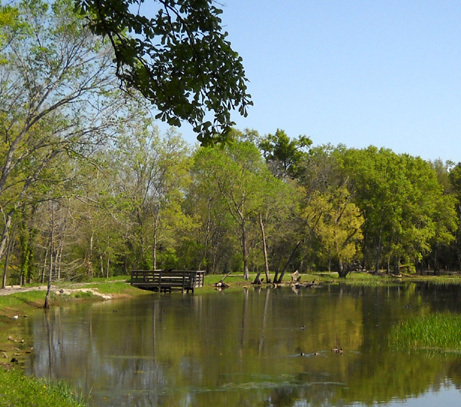 You can take a virtual tour of many of the parks on the Texas Parks and Wildlife Dept. website. Click on the web page for an individual park; if a short video is available, a link will be in the upper right corner. Most of the Texas state historical sites are day-use only. Most people use the state parks only during the day, too, particularly those near metropolitan areas. You can expect to find picnic areas at every park, and pavilions, shelters, dining rooms, lodges, or other group facilities at a large majority of them. I believe all of the state parks have some sort of accommodations for overnight visits. They may include primitive back-country camping, tent or RV camping in a developed campground, screened shelters, cabins, and lodges. Some of the most popular cabins and lodges were built by the CCC of native materials that blend in beautifully with the surroundings. There are also overnight group facilities and equestrian campsites in some of the state parks and natural areas. Not every park has all of these lodging choices but most parks have a variety from which to choose. Check the individual park web pages and/or the facilities index at the back of the parks guide (online or paper booklet). Call the park directly if you have further questions. 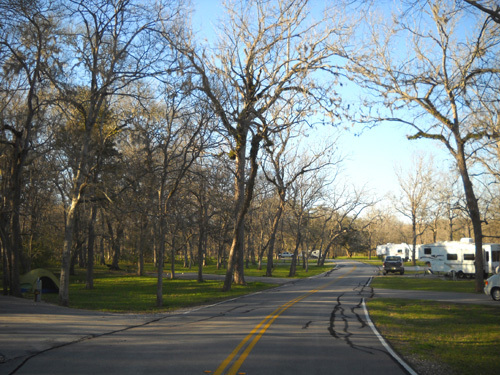 RV campsites vary in size from park to park. There are fewer sites that will accommodate our 36-foot Cameo 5er at Huntsville and Lake Livingston, for example, than at Brazos Bend or Mustang Island. That means we need to get to parks like Huntsville early in the week and not on a Friday afternoon, when the larger sites may already be taken. Note that in all or most Texas state parks you can reserve a spot in a particular campground (for example, the one with 50-amp service and not just 30-amp) but you usually can't reserve a particular site -- those are first come, first served. On our first visit to any park or other campground we usually call the park/campground directly to verify the size of the campsites before making reservations online or by phone -- in the case of Texas State Parks, to someone in Austin who can't possibly know the actual sizes of all the sites at all the parks. The reservation folks just give you the generic length/width listed on the website. Be sure to ask about weekly rates. I don't know if cabins and screened rooms ever have less expensive weekly rates, but Huntsville has one for camping in December, January, and February when the fewest people use the sites. That just so happens to be the months we like to be there for those races and/or to avoid winter weather farther north! Huntsville's $16/day rate becomes $13.71/day ($96/week). Those days will soon be over, however. 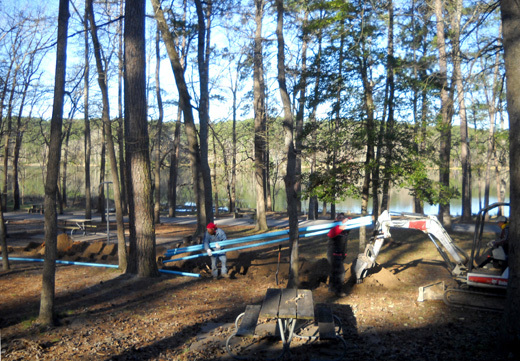 When the utility work (below) is done in the campgrounds at Huntsville SP later this spring, the rates are going up. I don't know if they'll still have weekly rates next winter, either. Here's something else to ask an individual park before you go, whether you'll be a day-use or overnight visitor: just how busy is it likely to be when you want to go? You may not even get past the entrance gate if you just show up! Several parks are so popular that they may limit the number of visitors on busy weekends, holidays, or Spring Break unless folks already have camping or lodging reservations. Make those reservations early (up to eleven months in advance) and contact park personnel even before a day visit if you have any inkling that a popular park like Enchanted Rocks, Inks Lake, or Brazos Bend may get so full that you can't even get in. Brazos Bend, for example, has sometimes closed the gate on super-busy Easter weekends after a certain number of vehicles has entered. There just isn't room for folks to park at the Nature Center, trailheads, or three large picnic areas, let alone enjoy their experience. It came real close to that situation the weekends before and after Spring Break this month, when cars were lined up outside the gate for half a mile on those Saturdays. You can make reservations for the Texas state park system by phone or on the internet. Oddly, there is a $3 fee to make internet reservations but no extra charge if you talk to a person on the phone. What's wrong with that picture? Jim sees the sense of it (customer convenience in being able to make reservations 24/7 online) but it seems counterintuitive to me from a financial standpoint. We prefer to talk to a person, though, if we have questions we think they may be able to answer knowledgeably. Last year we were able to stay at Huntsville SP the entire month of February but we couldn't reserve that many days up front. Jim either called the office or looked on the website each day after our arrival to see if all the sites were still reserved, then reserved as many days in succession each time as he could when someone cancelled and a spot became available. This year we had to split up a five-week stay at Huntsville in January and February because the park was booked on Presidents' Day Weekend in the middle of February. 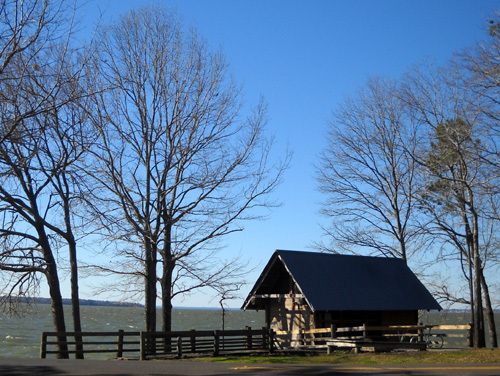 We decided to make reservations for six days around that weekend at Lake Livingston SP, which is about 50 miles to the east. If they had a weekly rate, we would have sprung for seven days at the price of six. 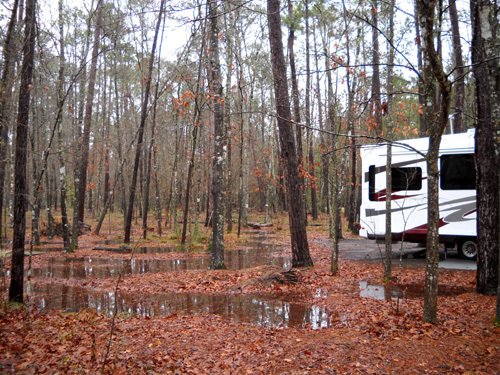 The Lake Livingston campgrounds were swampy after all the rain in mid-February. To our dismay it turned out that the holiday weekend was rainy and cold in central Texas and lots of folks didn't show up at either Huntsville SP or Lake Livingston. We could have hung around the office at Huntsville SP until 2 PM on Friday, extended our reservation for another two weeks when it was clear there were some no-shows, and kept the same campsite. But we decided not to take the risk and end up at WalMart all weekend. In retrospect it was interesting to see another park. 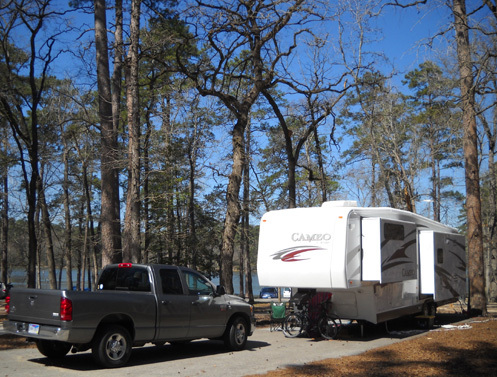 We also got to take the new Cameo for a second "shakedown" ride and we snagged the same campsite again when we returned to Huntsville for another 2+ weeks. We've gotten to stay at Brazos Bend this whole month, too, but we have to work for that! In the last entry I mentioned about becoming campground hosts a few days after we got here. Otherwise, we would have been gone after the first week because every weekend the campgrounds have been full. All or most of the state parks have an entry fee ranging from $3 to $7 per day per person over the age of 13. Entry fees are not included in the cost for camping or other lodging; they are added on. Children under 13 get into the parks free -- as do annual pass holders and their passengers. Those entry fees can add up in a hurry. Let's say a couple has two children ages 8 and 13. If they want to visit Brazos Bend for just one day and they don't have a current state parks pass, they will pay $5 x 3 = $15 to enter the park one time. If they're camping for a week, the tally for the entry fee is $15 x 7 days = $105, plus the campsite fees. If they have a park pass, they don't pay any of those entry fees. The state park passes we purchased in late 2008 and 2009 sold for $60 per passenger vehicle or $75 for two vehicles. The prices are still the same this year but park staff say they're probably going up next year. The pass covers the pass holder and anyone else in the vehicle, so Jim and I are both covered by that $60/year. Whether you have one or five people in your car, they all get in free on your pass. The pass is non-transferable; you may be asked for identification, but we never have. The pass doesn't cover any applicable facility or activity fees you may incur, just entry fees. You can stretch the state park pass beyond twelve months to thirteen months if you time your purchase right. The earlier in a month you buy it, the better. Purchase the pass on June 1, 2010 and it's good until July 31, 2011, a full thirteen months. Purchase it on any other day in June, including June 30 . . . and it still expires on July 31, 2011 (i.e., less than thirteen months). There's more good news. When TPWD sends you your "permanent" plastic annual pass in the mail you'll also receive discount coupons good for camping, park store merchandise, recreational equipment rentals, and some special promotions. Just counting the four discount coupons we got with our own pass, we saved $34 in campground fees at those parks. If you add in the entry fees we would have paid (at $4-5 each, per day) for the 45 days we paid camping fees at those parks (that number doesn't include four free days at Hill Country SNA or the three weeks we worked as campground hosts at Brazos Bend), the fees would have been in the range of an additional $380 that we saved by buying that park pass, for a grand total of over $400. Not bad for a $60 pass. Even if they raise the price a few dollars next time, it's well worth it to us. Bill's three discount coupons saved us an additional $28. We have one more of those left that we'll use on our summer 2010 trip, when we plan to spend some time at both Caprock Canyons and Palo Duro Canyon state parks on our way to Los Alamos, NM for the Jemez ultras in May. I got so jazzed up reading about these Texas Panhandle parks for this entry that I talked Jim into visiting them since they're not that far off I-40. That will help break up the long drive from Virginia to New Mexico and give us the opportunity to see two more interesting Texas state parks. 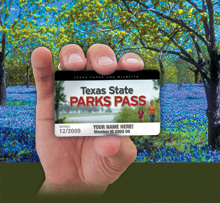 There are a couple of other Texas park passes you may be interested in. The "Bluebonnet Pass" was developed by the Texas Legislature for qualifying seniors, people with disabilities, and U.S. Veterans. See the pass web page for details regarding residency, proof of eligibility, and the amount of the discounts. The pass itself is free. There is also a Youth Group Annual Entrance Permit for non-profit organizations of up to 50 kids aged 13-18 and their adult sponsors. SO MANY CHOICES, SO LITTLE TIME . . .
We have really enjoyed all of the state parks, historical sites, and natural scenic areas we've visited in TX the past six years: Balmorhea, Brazos Bend, Galveston Island, Hill Country, Huntsville, Lake Livingston, McKinney Falls, Mustang Island, and Tyler. 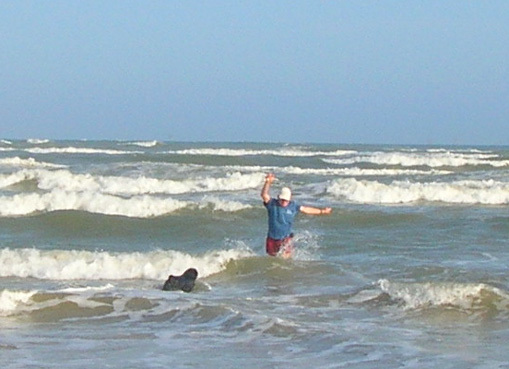 Jim and Cody enjoy the surf at Mustang Island SP in February, 2009. I've written about and included photos of all of them on this website (see topics pages from 2006 to 2010) except Tyler SP. We camped at Tyler for only one night in 2004 and neither of us remembers much of it! That means we'll have to go back someday. 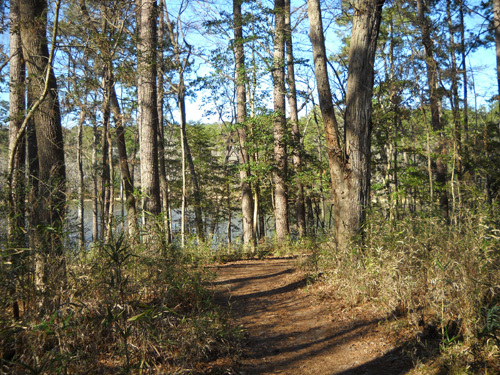 It has a nice trail system that the East Texas Trail Runners use for a 25K and 50K race each February. 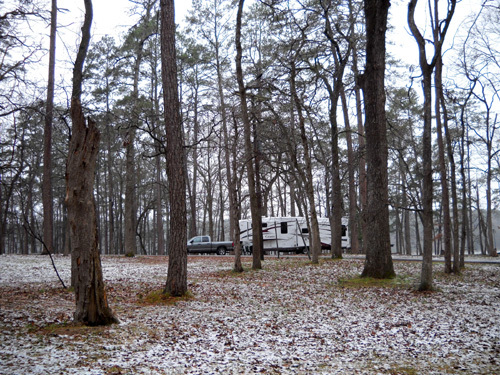 Of these seven sites, we've spent the most time by far camping at Huntsville SP the past three winters. We love the trails there for running, hiking, and cycling. We also like the campgrounds and the proximity to various services we need. HSP continues to host two large ultra running events: the Tejas Trail Runs in December (which replaced the now-defunct Sunmart 50K/50M races that were held there for about two decades) and the Rocky Raccoon 50/100M races in early February. I'll write more about the five weeks we stayed at HSP in January and February in the next entry. All of the parks we've visited except Tyler are in the southern part of the state; those visits were during the winter or early spring months. Texas gets mighty hot in the summer, when lots of Tejans join us in the mountains of Colorado. We'll have to time any Texas state park visits in the northern part of the state to the spring or fall when the temperatures are more moderate. That's why we want to see the two canyons (Caprock and Palo Duro) in mid-May. Hopefully, they won't be unbearably hot yet. Texas gets its share of winter weather but we do our best to stay far enough south to avoid snow and sub-freezing temperatures on our winter forays through or to the state from November to March. Heck, even Brownsville got down to or near freezing in January this year! You can't get much farther south in Texas than that. We were fortunate there was no frozen precipitation when it was only 9� or 10� F. at Hill Country SNA west of San Antonio for the Bandera races. We missed several inches of snow this past December while we were at McKinney Falls SP in Austin. The storm dumped 3-4" of white stuff nearby in every direction (even Houston got several inches) but skipped right over Austin. I was disappointed but Jim was happy! We also missed several other storms with snow and sleet that dumped up to a foot of snow in Dallas and other more northerly parts of the state. This was a cold, snowy winter for much of the southern tier of the country. Our neighborhood in Virginia got a total of about 48 inches of snow in several large doses, more than the previous five years combined that we've owned a house there. We knew a snowstorm was aiming for Huntsville SP while we were camped there in late February. 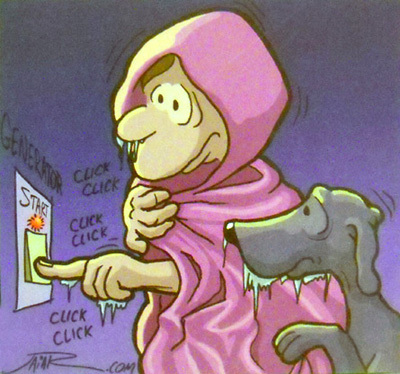 It didn't sound so bad so we turned up the furnace, hunkered down, and just waited for it. If we knew then what we know now, we would have headed for Brazos Bend earlier. I had to hustle outside in the morning to take a few pictures before it melted. Jim was happy it did! Pretty soon it warmed up again and started looking like spring. When we arrived at Brazos Bend on March 2, spring was in full force. I've got a long list of other Texas state parks and historical sites that I want to visit. I read about each one while working on this essay . . . and there weren't any that didn't interest me. You may think I'm easily amused. I am, but I'd rather think I'm like a sponge, always ready to absorb new information and view new scenery! Come along and enjoy the trip.